Great Gift! Matted and ready to pop into a standard frame: 1950s Patent document for the design for a Support for Bubble Light Device [this is for the well-known Shooting Star bubble lights. The tube contains two different chemicals, so the bubbles rise rapidly and then fall slowly to the bottom of the tube. Note that the base incorporates a positioning clip.] 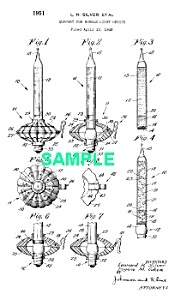 for M Goldman & Co., Bridgeport, Conn.
We have other Christmas light patents on this site. Image included here is low-quality for quick loading on the net with SAMPLE written across, which will not be on your print. Yours will also include the patent number and date.